Blurb Description: Ramona was only five years old when Hurricane Katrina changed her life forever. I read Julie Murphy’s Dumplin over a year and a half ago, and I fell in love with Willowdean and her world. It was also my first review copy from an Indian publisher, and it will always hold a special place in my heart. 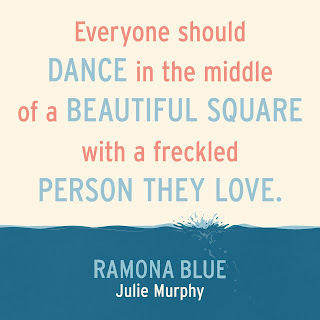 Which is why I had HUGE expectations for Ramona Blue, and it was one of the first book I started reading from my TBR that suddenly seems to have multiplied itself threefold. 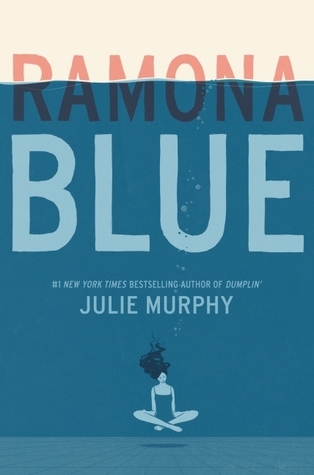 The first two thirds of Ramona Blue was slow, to say the least. I like the message that the story was trying to convey but through the course of 400 pages, I struggled and I mean I really struggled to connect with all the characters. I found myself bargaining in my head, how about just 50 more pages now? Well, come on, you can do 50 more and so on and the end result is that I simply didn’t enjoy it. 1. THE FLUID SEXUALITY: It was one of the highlights of this book for me. I love that no matter what, there were no labels being thrown around after Ramona noticed that she liked Freddie (apart from girls) romantically too. 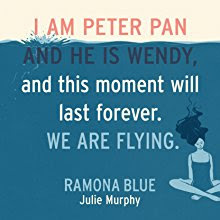 Being put under a label wasn’t a part of, or even a little bit, of what Ramona Blue was about and I absolutely love that. 2. THE SWIMMNIG: I’m a swimmer. I used to do it competitively and although I gave that up a while ago, I know what it feels like when Ramona says that any workout feels only like the beginning. I love the water and I love that swimming was FINALLY incorporated in a Young Adult book is a serious way. 1. THE PACE: Honestly, this book was SO SO SLOW. It has 430 pages of “self-discovery” but so much of it was filler. Like I said in the beginning, I kept bargaining with myself to read a few more pages, and eventually made it to the end. Even the part where Ramona “realises” after 300 pages of being dead against it, to leave her home and pregnant sister and go to college is because her sister spites her and chooses to have her boyfriend in the OR instead of Ramona. It all felt so subpar. 2. THE CHARACTERS: Like I said, it was SUCH A STRUGGLE for me to connect with ANY of the characters. All of them felt like underdeveloped secondary characters and I didn’t feel anything for any of them. Occasionally, there was a fun scene like the time where everyone meets Adam’s parents but AAH I just couldn’t with any of them. I love what this book stood for, I like the idea behind this book and I LOVE THE FACT THAT SEXUALITY WAS FINALLY PORTRAYED AS SOMETHING THAT COULD BE FLUID but that was all. Everything else about this book was subpar and I can only wish that I had connected with the characters. 3 stars. Julie Murphy is a potty-mouthed Southern belle who was born in Bridgeport, Connecticut, but found her home in Fort Worth, Texas. She’s never seen Star Wars, but has yet to meet a made for TV movie she didn’t love. When she’s not writing, Julie can be found cruising Costco for free samples, watching Sister Act 2, stalking drag queens on instagram, obsessing over the logistics of Mars One, and forever searching for the perfect slice of cheese pizza. She lives with her bearded husband, two vicious cats, and one pomeranian that can pass as a bear cub. DUMPLIN’ is her second young adult novel. Here’s a link to a more serious and less nonsensical bio for grownup things. Julie is represented by John Cusick of Folio Literary Management. 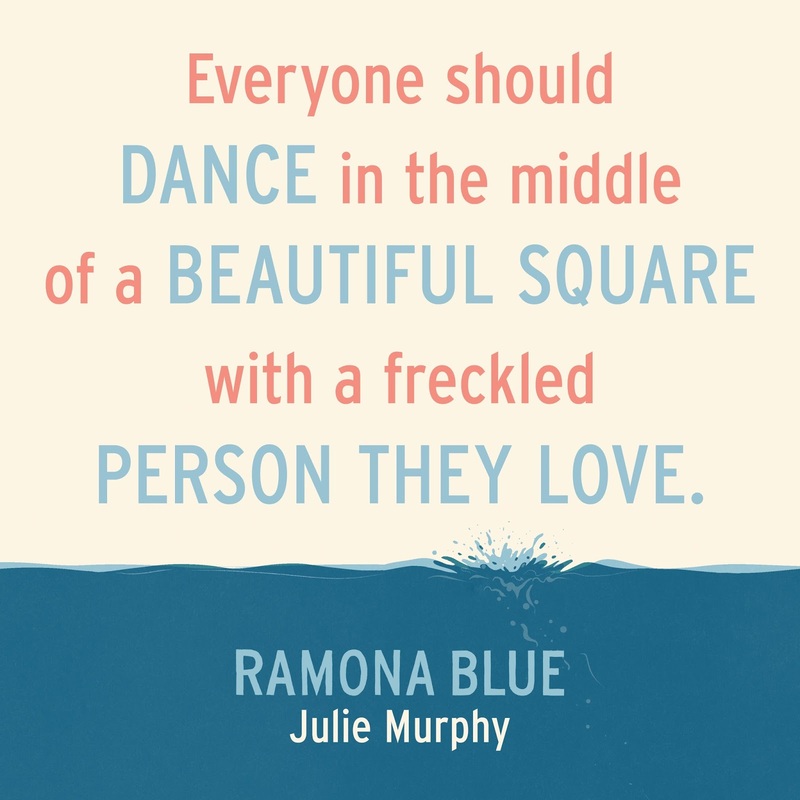 Have you read Side Effects May Vary, Dumplin' or Ramona Blue? What did you think of them and which one is your favourite? Are you excited that Dumplin' is getting turned into a movie? What are some of the best YA Contemporary books you've read this year? I can't wait to hear from you <3!